It’s that time of year again, when bridal fever hits London in the form of the National Wedding Show at Olympia. We will be showing all our gowns including the new Rhythm and Blues on our Stand D40. ” I didn’t expect to try dresses on today ” So forewarned is forearmed- make sure you wear something easy to slip in and out of and ideally leggings or tights you can keep on under the dresses as it can be a bit intimate in a communal changing room. Our own shop is empty of dresses from Thursday 19th Feb and closed all day on the Saturday so please plan your appointment for the following week. Following on from November’s regional finals, the event saw all of the winners from around England come together to see who would walk away with the coveted titles. 27 awards were up for grabs, rewarding everyone from designers and retailers to stylists, florists, planners and entertainers. When founder of The Wedding Industry Awards, Damian Bailey took to the stage along with co-host Isabel Webster from Sky News’ Sunrise, the audience was on tenterhooks waiting to see who would be recognised as being the best in the wedding industry. 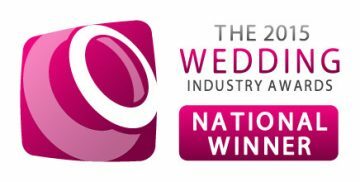 With the UK wedding industry being worth an estimated £10billion annually and hundreds of suppliers in competition with each other, to be crowned national champion in no mean feat. Companies had to not only catch the judge’s eyes but also receive first-class feedback from their recent clients. And another Nomination……. It has been an exciting week. Hot off the heels of our TWIA Regional Award we were named as one of five finalists in the Best British Bridal Collection category along with Benjamin Roberts, Ellis Bridals, Ivory and Co and Amanda Wyatt. This is judged by the real bride readers of Wedding Ideas Magazine and the winner will be announced at a glittering ceremony on the 23rd January at The Tower Hotel London. 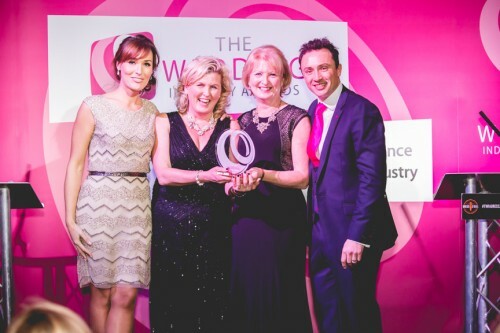 Fantastic news – Last night (25.11.14) we went to Farnham Castle Surrey for the TWIA London and South East Region awards ceremony. We were delighted to be announced award winners in the Best Dressmaker/ Designer category and were presented with a Regional Winners trophy. Wowee! A big thank you to all our fantastic brides of 2014 who voted for us and who appreciate the work we do at Forget me Not Designs. The wedding season 2014 is in full swing and we are burning the midnight candles here at Design HQ to get all the last minute final details done on the dresses for our lovely brides. We do love to see the finished result with hair and make-up all done and that special smile that says “I’m getting married today!” look for the camera. So, please do send us your images to look at, to make all that midnight toil worthwhile and we will share them with other brides to be, on our gallery page. So many gorgeous dresses to choose from, but where do you start? We advise trying on 4 or 5 different shapes, to get a feel for styles that best suit your body and then we can advise different gowns to try on pulling all your thoughts together. Often you will come up with your own bespoke design having chosen the neckline or sleeve from one dress and the fit and fall of the skirt of another to be made using your favourite choice of fabric and trimmings. Once ordered, the fitting process begins with a Toile which is moulded to your body shape and over your wedding day bra. A month or so later the next step is the Dress fitting. By now the toile will have been used as a pattern to create your made to measure gown and your wedding dress is ready to try on for hemming, buttons and finishing. We prefer to see you a third time to try on the dress completely finished and to make sure it is perfect for you. If a third visit isn’t possible we can send it to you once completed via our courier.